I LOVE Chicken Thighs but HE CRAVES Chicken Breast; This ONE Dish works for both! (each dish variation serves 4) | Crappy Kitchen - Good Dinners! This is a dilemma in my house; myself and my daughter love the leg and thigh of chicken, while my son and husband prefer the breast meat! It is not really a problem when you roast a whole bird, but when you want to make anything else it can turn into a problem. One could argue that whatever I serve up for dinner should be eaten with very grateful hearts, and I have certainly gone down this road many times, but other times, when I’m feeling particularly generous, I what to give whomever I am cooking for exactly what they crave. This is a fantastic solution and takes no more time than if you made one dish! The idea came to mind when I happen to be cleaning my kitchen and I saw my two identical baking dishes buried under some other pans. They screamed “USE ME!” and so I did, placing chicken thighs in one and chicken breast in the other, thereby satisfying us all without having to fish out the various parts for each plate. 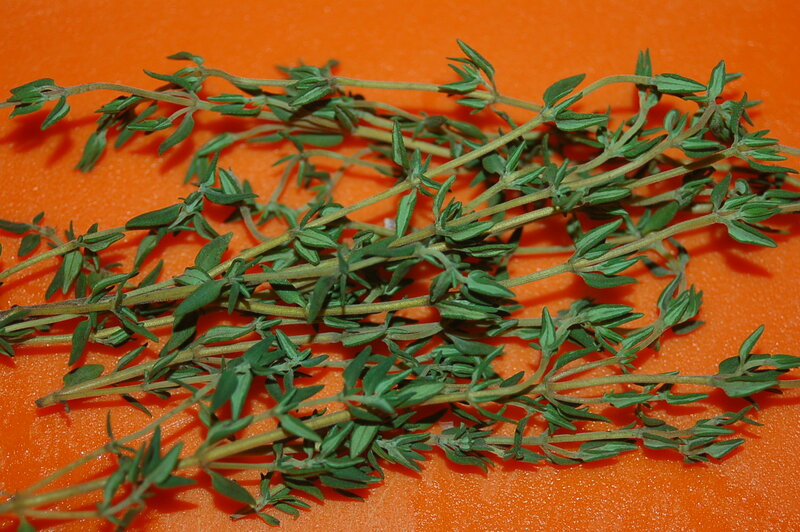 The thyme in my garden is still going strong! 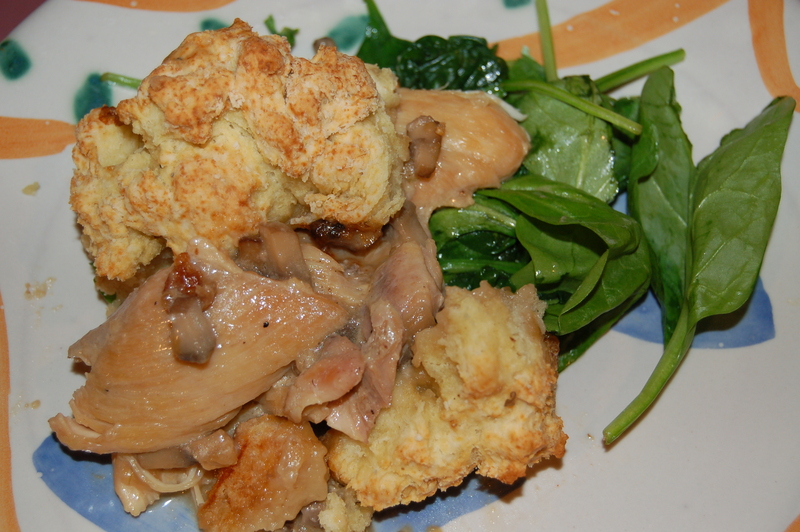 This is a recipe you have to try if you are in the mood for true comfort food. 2 – Turn heat down to medium/low and add about 1 tablespoon of oil to the pan. 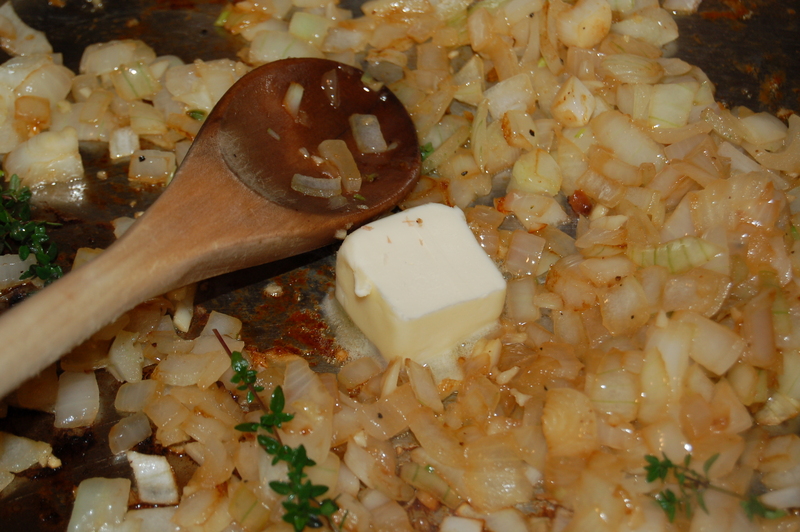 Add the onions and garlic and cook for about 5 minutes before adding the diced mushrooms. Turn heat up and cook for about 5 minutes. Add the thyme and butter and continue to cook until the mushrooms are nice and soft (about 8 more minutes). 4 – Pour equal amounts of the sauce over each dish and place in your preheated oven for 20 minutes. 5 – While chicken is cooking make the topping. Put flour along with the other dry ingredients into a big bowl and stir everything together with a whisk. Cut the butter into the flour and knead the butter into the flour until you have a fine rubble. Add the cheese (if using) and toss it in with your hands. Make a well in the center and add the buttermilk. Mix everything together with a wooden spoon (work from the outside scraping into the center). Add more milk if there are still dry pockets of flour. The mixture should feel slightly sticky. Set aside until ready to use. 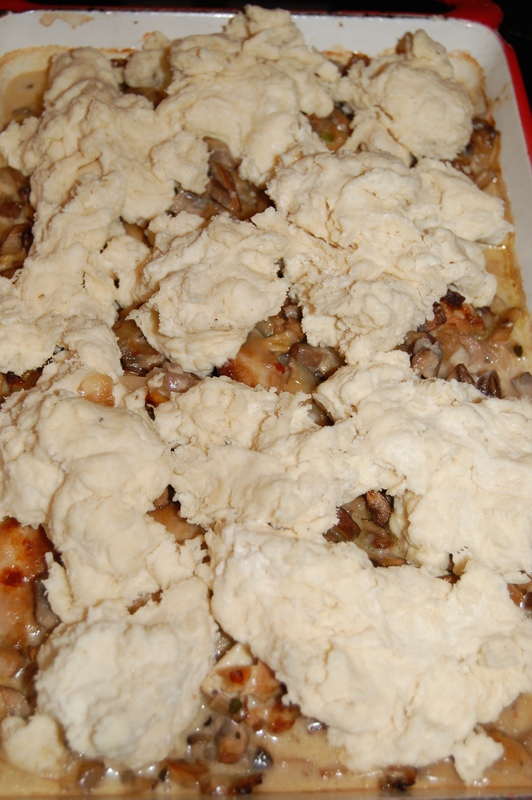 6 – After 20 minutes, take chicken out of the oven and dot the dough over each in irregular mounds. Do this with your hands (it’s the easiest way) Place back into the oven for another 15 minutes or until the crust in a nice golden brown. Remove and let rest for 5 minutes before serving. Serve as is or with veggies: boiled carrots and peas, sautéed spinach or other hearty green OR a big green salad! This entry was posted in dinners and tagged baked chicken, chicken and mushroom sauce, chicken breast, chicken thighs, comfort food, creamy baked chicken, easy chicken dinner, mushroom cream, mushroom filling, mushroom sauce, timo sarpanevo, timo sarpanevo casserole dish. Bookmark the permalink. This is one of the things that makes us very different…i would make my own dinner, and tell them to either cook themselves or do without! This is exactly how it is in our house! Works out great.